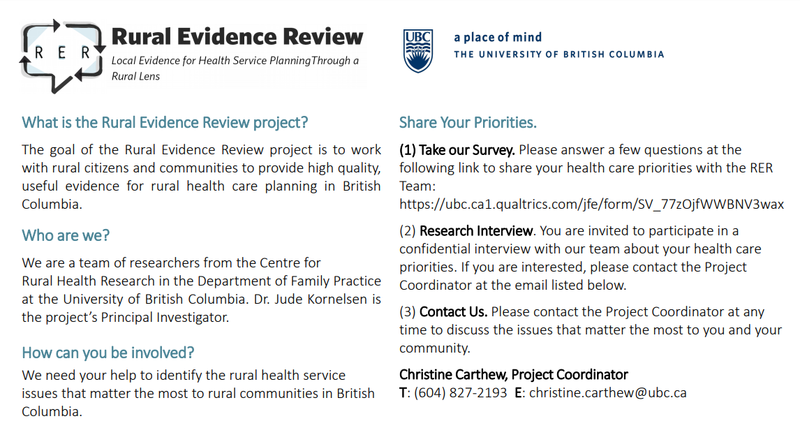 The goal of the Rural Evidence Review project is to work with rural citizens and communities to provide high quality and useful evidence for health care planning in British Columbia. Are you a resident of a rural or remote B.C. community? We need your help to identify the health care priorities and needs that matter the most to you and your community! Take our survey, participate in an interview, or contact the project’s Coordinator (christine.carthew@ubc.ca) to learn more. Have you received IVF for sub-fertility, and received maternity care from an obstetrician, family physician, or midwife in BC? You may be qualified to participate in our research study! Please see the poster for more information about the study and how you can participate.